The LX wick is a uniquely braided, coreless, flat wick manufactured with stabilizing threads that ensure an optimum burn profile. This allows for a very stable and consistent flame, which minimizes, or eliminates, carbon buildup (mushrooming) while reducing afterglow, smoke and soot. The Wedo LX series of wicks are an excellent choice in paraffin and vegetable-based waxes for pillars, container candles and votives. 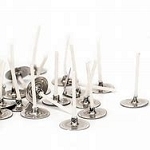 The candles indicated for each size wick are merely guidelines. The candles indicated for each size wick are merely guidelines. The ROC (rate of consumption) is the amount of wax consumed in ounces per hour in a standardized test. The rate may vary with different waxes. Test burning is always recommended to determine the proper wick for your wax formula and container. Use with our Wick Stickers to keep the wick centered in your container! Pre-tabbed prewaxed LX wicks. 2.5" long- used for votives and small containers. LX Wick Sampler Kit - 10 each, 50 wicks total. Pre-tabbed prewaxed LX wicks. 1" long- used for votives and small containers. LX-12 Wicks- prewaxed and tabbed. 2" to 2.5" diameter containers. 4" long. LX-16 Wicks- prewaxed and tabbed. 2.5" to 3" diameter containers. 5" long. LX-20 Wicks- prewaxed and tabbed. 3" to 3.5" diameter containers. 6" long. LX-22 Wicks- prewaxed and tabbed. 3.5" to 4" diameter containers. 7" long. Wick Type Container Size Length R.O.C.